October Art Scene returns with paint-by-number community painting! Academy Park Enrichment and Performing Arts, located at 120 Everbright Ave. will host artist Wendy Franklin and Samantha Nolloth. Bagbey House, located at 134 Fourth Ave. N. will feature works John Green and Southern Vintage Woodworks. John works with old and new wood to create heirloom pieces. Franklin First United Methodist Church, located at 148 5th S. will host artist Reid Jacobs who creates custom handcrafted gifts by utilizing mostly local hand harvested woods. Gallery 202, located at 202 2nd Ave S. will host local artist Julie A. Harvey. Hope Church, located at 137 4th Ave. S. will host Linda Watson, an artist born and raised in the south whose style is American Impressionism. Imaginebox Emporium, located at 311 N. Margin, will showcase the original illustrations created by Cory Basil for his young reader novel The Perils of Fishboy. Jack Yacoubian Jewelers, located at 300 Public Square will feature artist Mike Martino, an acclaimed artist and printmaker. Moyer Financial, located at 400 Main St. will host local photographer Danielle Del Valle, showcasing her love of taking unique landscape photos. Parks Realty, located at 415 Main St. will feature works by the artist Linda Burns with Morgan&Me Designs. Scout’s Barbershop, located at508 W. Main St. will feature the musical stylings of Heidi Buyck, a singer songwriter from Chicago, Ill.
Wellspring Financial, located at 517 Church St. will feature artist Lauren Ann Markham who has a passion for hand-lettering and graphic design, while continuing to create fine art. Willow Plunge Arts, located at 230 Franklin Road in the Factory will showcase photographs of the endangered wild Mustangs of Utah by photographer Kisa Kavass. Winchester Antiques, located at 121 2nd Ave. N. will feature works by Linda Gale Boyles, owner and creative director of Southern Inspirations by Linda Gale. Williamson County Archives, located at 611 W. Main St. will present abstract oil paintings by San Francisco based artist Chloé Meyer. Zula & Mac, located at 301 Lewisburg Ave. will feature artist Harrison Houle whose medium of choice is oil on linen and mixed medium of oil bar & oil pastel on paper. 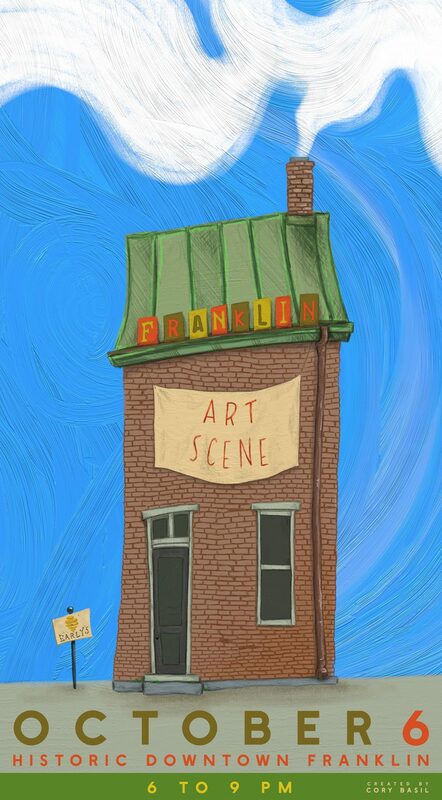 The Downtown Franklin Association invites lovers of the arts to stop by all participating locations during the evening’s crawl. On the way, guests are invited to try their hand at contributing to a painting of the Dr. McPhail building. Franklin Art Scene guests may begin their crawl at any participating location on the map. The Art Scene trolley is also available for free rides throughout the crawl.